We all make promises, only some of us keep them. 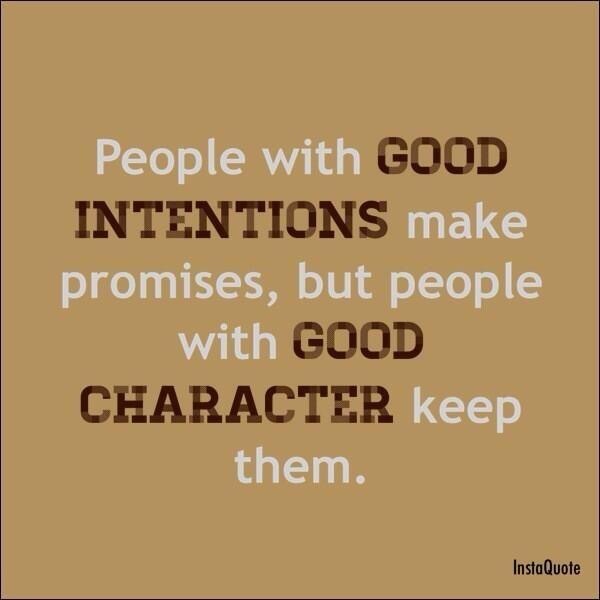 Some people have good intentions to keep their promises but don’t always follow through. Others have no intention to keep them and just say something to keep their peace. Especially with children we have to be careful when we promise something. Isn’t it true that they won’t let you forget and hold you accountable to what you have said? Last but not least there are people who always follow through and you can trust these people that they will keep their word. Isn’t staying true to your word an awesome character trait to have? I know that some people (especially in Canada) want to be polite and don’t say “no” even if they are not even interested in doing something or engaging in a service. That’s called passive aggressive (= indirect resistance to the demands of others). In my early years in business I found this super challenging. I had absolutely no idea that a “yes, call me in 3 weeks again” wouldn’t mean “not now”, it actually often meant “never”. I can recall countless moments when I felt confused, frustrated and hurt. Fake Politeness: With a “delayed no” you will hurt a person’s feelings even more. Sincere Honesty: Learn to be honest with yourself and others. It is important to be able to state a clear “Thank you for your presentation. This product/service isn’t suitable for our needs”, or “Can I be honest? This movie isn’t one I am interested in watching”, or “I would love to get together but the weekends are reserved for my family” or “No, I didn’t forget the tip. I found the service wasn’t good”. These are just a few examples from my life. Emotional Awareness: Ask yourself, “Why do I feel so uncomfortable saying no?” will help you to find an answer (maybe it comes from your childhood, maybe it is a limiting belief that holds you back, maybe you think saying “yes” solves the problem). Get to the bottom of things. Think New Thoughts: People appreciate when you are polite, respectful and honest at the same time. Integrity: Keep your promises or don’t make them. It’s as simple as that. I would rather be rejected than strung along, wouldn’t you? Now that you know better, be better. Good character does matter.